I have been reporting extensively on the “digital first” approach UK news agency Guardian News & Media has decided to take and now it looks like they are attempting to further push out print subscribers by raising prices for their popular but faltering publication. 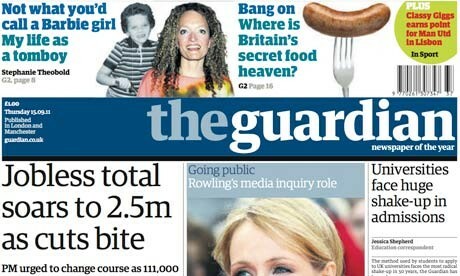 Weekday print copies of The Guardian have been raised 20p to £1.20, while the Saturday edition was increased by 10p to £2.10. Based on those pricing options the Guardian is now the second most expensive weekday and Saturday paper in the country, directly behind the always expensive Financial Times. Over the last four years the paper has become significantly more expensive, raising to 80p in 2007 and then £1 in 2009. The price increase comes after subscriptions fell by 10.1 percent year-to-year, currently sitting at 241,287. The company also announced a loss of £33 million over the 2010/2011 financial year. Along with the price increases is an expected loss of jobs, although that number has not been specified.